So naturally, I decided to make thumbprint (or bird’s nest) cookies with the leftover dough from making the Pineapple Tarts. I used strawberry jam (my favourite), but you can use whatever you have. I found that the dough is actually too dense/rich for these cookies, and not sweet enough. But hey, it’s an easy-peasy way to use up any leftover dough! Here’s the Pineapple Tart dough recipe. 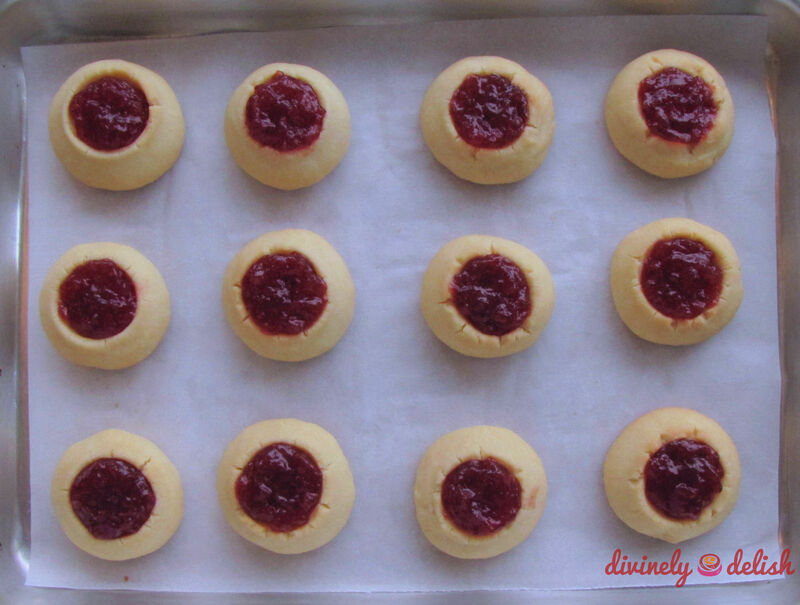 Just preheat the oven to 350F, roll the dough into 25-gram balls, place on a parchment-lined baking sheet, flatten balls slightly with the palm of your hand, then use your thumb or a fondant ball tool to make indentations in the centre of each ball. Bake for about 25 minutes until the bottoms are lightly browned. 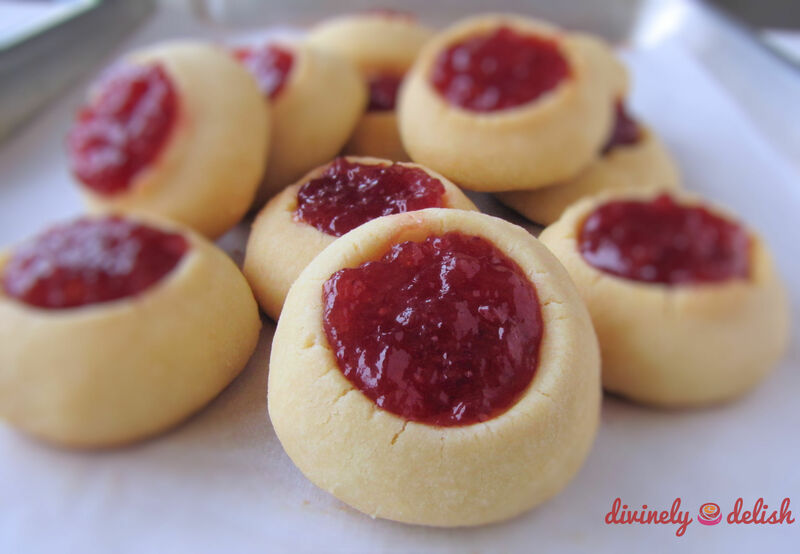 Remove from the oven, fill each cookie with jam. 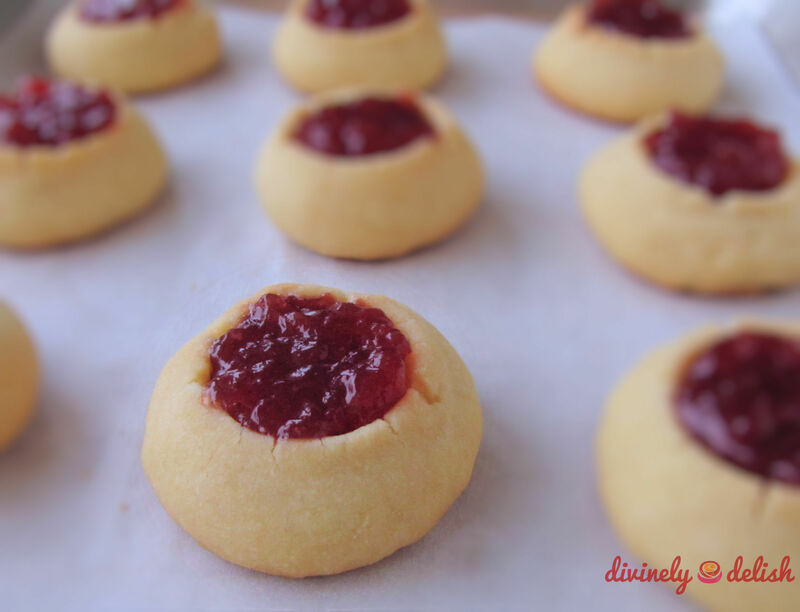 And then – although I did not do this – I would suggest baking the cookies for a further 5 minutes so that the jam “cooks” a little and will be less runny once the cookies cool. These look like perfect bite sized cookies! I think I’d like to try this with raspberry jam. Hi loveandumami, I actually made them bigger than bite-sized, but I would definitely suggest that you do make them small, especially since the cookie will be pretty dense and rich. Enjoy and thanks for stopping by!